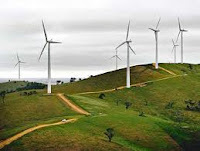 Werner's Cairns blog: Is wind power just a lot of hot air? Posted by Werner Schmidlin at 2:19 PM Labels: Wind power. I dont think I have ever read such an falsehood based, biased, ignorant and mis-informed rant. I could substitute "fossil fuel based generating systems" for every "windpower" in this deranged article and it would be closer to the truth. I could provide absolute scientific and power industry published proof to refute everything contained in this rant, but I doubt it would have any effect on Ms/Mr Forbes. Let's try to understand wind power. Every wind farm needs backup generators to supply power when the wind fails. If there is no wind, zero electricity is produced by the turbines and all power comes from the backup generators (mainly coal or gas in Australia). If wind speed exceeds design capacity, the turbines are shut down to prevent damage, and all power comes from the backup generators. In freezing still air, the wind turbines take electricity from the backup generators to prevent damage from cold. And they draw power to get reconnected. When the wind blows strongly all over the wind farm, the grid may not be able to cope with the surge in supply so some turbines may be paid to close down, producing no electricity. And on those rare occasions when a steady wind in the right place produces just the right amount of power to supply the demand at that time, the backup generators produce no useful power but waste fuel to maintain "spinning reserve" and to ramp up and down when the wind fluctuates. Now we find that wind power probably increases the production of carbon dioxide (not that this matters). Why not scrap the wind turbines and produce a steady supply of low cost power from the backup generators?